Despite the high tackle numbers for both teams (9079 in Sydney's favour), this was a very open match, with both teams recording over 400 disposals and 160 handball-receives. A goal to Pavlich in his 350th. He has kicked a goal in every home and away season game agains the Swans since 2013. Two goals to Isaac Heeney in the last quarter, both launched from possession gains, taking the Swans tally in this category today to 12.8 (80). The Swans average 54.3 points per game from this source in 2016, ranked 7th. Swans InterchangeJake Lloyd and is possibly out for the game. Careerhigh numbers for David Mundy in groundball-gets (17) and contested possessions (22) to go with a team-high 38 disposals. That goal to Josh Kennedy comes from his 40th disposal of the day, a new careerhigh agains the Dockers. He averages over 32 disposals a game against Fremantle in his last five matches including today. The Swans are outscoring the Dockers from stoppage clearances 6.2 (38) to 1.0 (6) and the 177 hitouts-to-advantage is a big reason why. 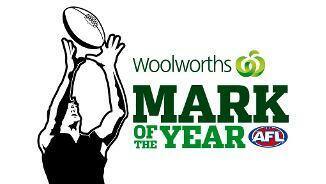 That translates to an advantage rate of exactly 50 per cent, well above their season advantage rate of 25.7 per cent. Fremantle were leading the way in total marks in the first half, recording 6334, but the Swans have halved the difference in the third quarter, recording 25 marks to Fremantle's 10. That's Tom Mitchell's third goal for this quarter, and with the help of the wind the Swans have been incredibly efficient in their scoring this quarter, scoring a goal from 46.6 per cent of inside 50's this quarter. Fremantle has retained possession from 47 per cent of its kicks inside 50 this season, the fourthlowest percentage of any side. Today they've retained possession from just 13.6 per cent of kicks inside 50. The wind is certainly having an effect on the flow in this game, as Fremantle won the inside 50 count 1511 in the second quarter, but are otherwise being beaten 25-12 in this category. Two goals in quick succession for the Swans, both launched from attacking midfield. They have now scored 6.3 (39) from score launches in this zone today, well above their average of 24.4 points per game from this zone, ranked 14th in the AFL. Dan Hannebery has been outstanding for the Swans in the first half, with 22 disposals at 73 per cent efficiency, to go with gamehigh numbers in metres gained (490) and inside 50's (eight) as well as kicking 1.1 (7). Fremantle only took one mark inside forward 50 in the first half, from which Shane Yarran scored a behind. Fremantle average 9.6 marks inside 50 per game in 2016, ranked last in the AFL. A goal to Crozier to reward the Dockers efforts in attack this quarter. Crozier is averaging careerhigh numbers in disposals, kick-to-handball ratio, marks and uncontested possessions, and has surpassed his previous best for games in a season (14). That behind to Langdon is the first score the Dockers have registered from six straight inside 50's. The Dockers have registered a score from 46.1 per cent of inside 50's this season, ranked 11th in the AFL. Today they're going at 22.2 per cent. Aliir Aliir has shown plenty of potential in recent weeks, and is continuing his good form today, leading all players on the ground in intercept possessions (six). He also has six contested possessions and three Free Kicks For. 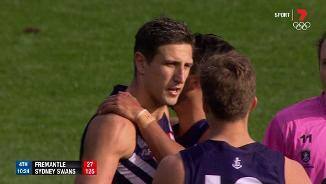 Two goals to Fremantle, two goal assists to Matthew Pavlich. Zac Clarke won three of the four hitouts from centre bounces in the first quarter, but the Dockers failed to capitalise, allowing Sydney to score 2.0 (14) from centre bounces to 0.0 (0). Sydney average 1.4 goals per game from Centre Clearances in 2016. That goal to Taberner was launched by a Garrick Ibbotson intercept mark, his first for the day and his second intercept possession of the match. Since 2011, no other Docker has taken more intercept marks than he has (198). After six straight behinds, Hannebery kicks the Swans second goal. Sydney are ranked 12th in the AFL in 2016 for goals scored per inside 50, kicking straight from just 24 per cent of forward entries. Sydney have been camped in their forward half for 89 per cent of the match so far, leading to seven inside 50's to none and 1.3 (9) to 0.0 (0). Matthew Pavlich will be looking for a win in game 350 today. He is averaging 3.2 tackles per game in 2016, his highest mark in that category since 2011 (4.3), which was his last season as a fulltime midfielder. 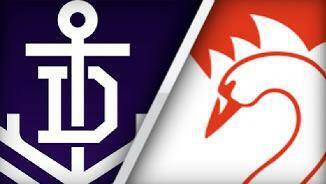 Expect a highpressure match this afternoon, as both teams are ranked in the top four in the AFL for average tackles per game in season 2016 (Sydney ranked first: 82.3 per game, Fremantle ranked fourth: 73.1 per game). 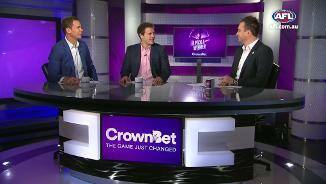 Since Round 13, the Fremantle Dockers lead the AFL in percentage of mark playon's (45.3 per cent), and are ranked second in the AFL for percentage of Long Kicks (45.7) and Forward Kicks (92.1) in general play. Sydney are the number one ranked team in the AFL in season 2016 for points launched from defensive midfield differential (plus 15.2 points per game), over nine points more per game than second ranked Adelaide. Welcome to Domain Stadium for the Fremantle v Sydney Swans Round 19 clash. THE SYDNEY Swans crashed the party of Matthew Pavlich's 350-game milestone with a 90-point thrashing of Fremantle in Sunday's wet and windy clash at Domain Stadium. Swans midfielder Josh Kennedy tallied 45 disposals and three goals in the 21.11 (137) to 7.5 (47) victory, with the result keeping the Swans in the hunt to finish second. 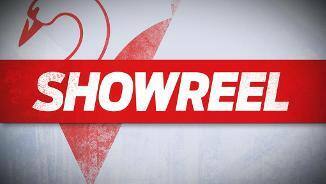 "He was outstanding," Swans coach John Longmire said. "He's played some really good games for this footy club, but it would have to be up there with them." The big win lifted the Swans' percentage to 140.0 to move to within striking distance of Greater Western Sydney (142.0 per cent) in the race for a top-two finish. The Swans take on Port Adelaide, St Kilda, North Melbourne, and Richmond in the final four rounds, giving them an excellent chance to edge out the Giants and Geelong for second spot. Longmire said it was one of the Swans' best team performances for the year. "Our defensive/offensive shape was really positive as far as working together as one," Longmire said. "It was fantastic really. It was as good as we've done it all year. And I'm happy some of our younger players get some more experience in front of a big crowd away like this. It's fantastic to be able to do that." Fremantle remains mired in 16th place with just three wins to show from 18 games. 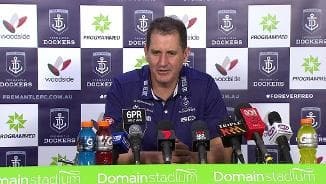 "We have some genuine concerns out of this," Fremantle coach Ross Lyon said. "Pre-season can't come quick enough at the minute." Defender Zac Dawson is facing the likelihood of a suspension after dishing out a heavy hip-and-shoulder to the face of Swan Jake Lloyd, who lay prone of the ground for more than a minute before recovering to walk to the bench. The Swans' win was their biggest against Fremantle, eclipsing the 77-point margin they posted in round 13, 2002 at the SCG. Pavlich was cheered by the 32,401 crowd every time he touched the ball, with the 34-year-old finishing with 15 disposals and two late goals in a hard-working effort. After the game, David Mundy and Chris Mayne chaired Pavlich off through a guard of honour formed by Fremantle and Sydney Swans players. But the 34-year-old's milestone will forever be remembered as a dark day for the club, with the Dockers going from minor premiers to easybeats within the space of a year. "Milestone games never get you across the line," Lyon said. "They don't guarantee results. But certainly for Matthew and Lee (Spurr's 100th game) we would have liked a better performance." "We struggled to get it out of our defence, which has been an issue all year, and it reared its ugly head again. "I thought their midfield, their big bodies, we were doing a lot of tackles and we wore down, we struggled to sort of stop them, clearly." Scoring chances were few and far between for Fremantle in the first half, but Pavlich was in the thick of the action for most of them. Pavlich sharked the ball off the back of a pack and handballed to Matt Taberner for Fremantle's only goal of the first quarter. And Pavlich produced a bizarre highlight early in the second quarter when he balanced the ball on the back of his head while in congestion before feeding it out for a Mundy goal. 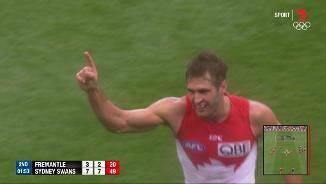 The Swans led by 29 points after a wet and windy first half and that was just the entree. 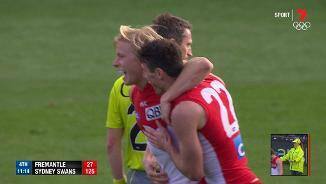 The third quarter became a feast for the Swans as the rain finally made way for sunshine, with Tom Mitchell booting three of their eight goals for the term as the game turned into a romp. 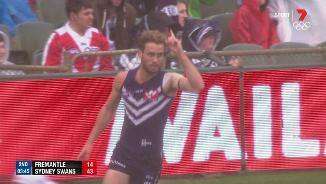 Fremantle: The Dockers appeared to escape without injury. Sydney Swans: Lloyd will need to be monitored during week. Longmire said he was OK but he had not done a concussion test because there was no need for him to come back on in the last quarter. The Dockers face West Coast next Sunday in one of the least meaningful Western derbies in recent seasons. The Swans return to the SCG to host Port Adelaide on Saturday afternoon. Reports: Zac Dawson reported for rough conduct on Jake Lloyd in the final quarter.